The San Diego State Aztec football team is no joke. Coming off a 10-3 season and a second place finish in the Mountain West standings, Rocky Long and his Aztecs are ready to make some noise in 2018. Once again, Long has put together a solid squad and one that should contend for a Mountain West title as well as a Bowl Game bid. 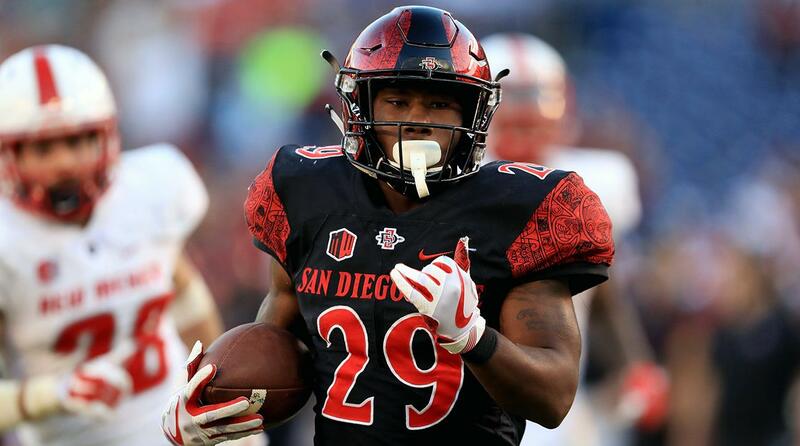 If the Aztecs are truly going to have success this season, however, they are going to have to do so without the likes of first-round running back Rashaad Penny. The nation’s leading rusher last season, Penny broke out in 2017 to the tune of 2,248 rushing yards and 25 total touchdowns. While it will be difficult for anyone to replicate what Penny did last season, considering how astronomically insane his numbers were, junior Juwan Washington is ready to take over as the primary back for the Aztecs offense. Standing at a mere 5-foot-7, Washington doesn’t necessarily have the size and frame that screams “bell-cow back” to most people, but his sneaky athleticism and explosiveness are what makes him such a talented player. While Penny did command most of the workload last season, Washington was not completely excluded from the offensive gameplan. In 2017, the Kennedale native carried the football 127 times for 759 yards and seven touchdowns while also returning two kick returns for touchdowns. On top of being able to maintain a heavy college workload, Washington is also capable of taking a handoff 60 yards to the house. He is extremely explosive and elusive, similar to Penny, and runs through lanes well when they are available to him. While Juwan Washington is a talented player, it surely doesn’t hurt him that he happens to play on one of the most dominant running offenses in all of college football. 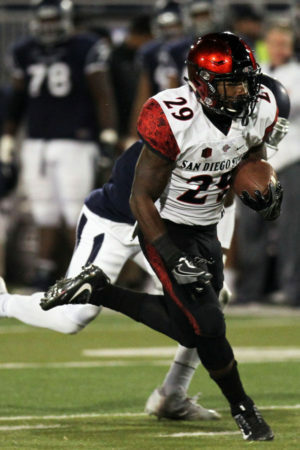 Last season, the Aztecs ran the football 575 times and had 33 total rushing touchdowns on the season. With a fairly talented offensive line, Rocky Long wants to run the ball as much as he possibly can and put the ball in the hands of his most talented player. Having a head coach with a run-first mentality is only going to benefit Washington and aid him in putting up stellar numbers. While the argument can be made that the Aztecs may use more than one running back, it doesn’t really make sense. Take the last two Aztec seasons for example. In 2016, the Aztecs gave their starting running back, Donnel Pumphrey, 349 carries while also giving backup running back Rashaad Penny 136 carries. Even last season, when the Aztecs gave Penny 289 carries, Washington racked up 127 touches as the backup. 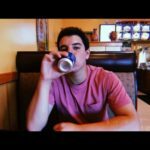 It’s true, there is a clear history of the Aztecs using multiple running backs, but it’s also very evident that the starting running back receives the majority of the workload. This season, Washington is penciled in as the starter and there should be no concern that his workload won’t be big enough. 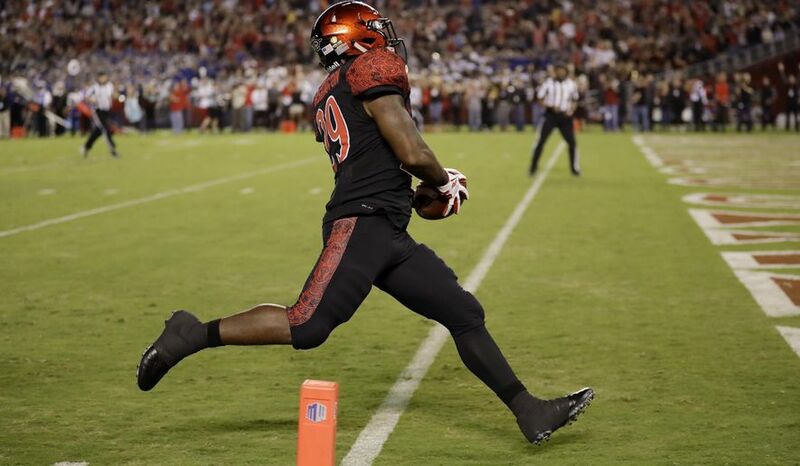 In the last couple of seasons, the Aztecs have produced two NFL running backs in both Donnel Pumphrey and Rashaad Penny. With a team that wants to run the ball as much as the Aztecs do, combined with the talent of Juwan Washington, keep your eyes peeled for a breakout season from the Aztecs’ lead back.